FDOT is scheduled to begin a lighting improvement project along State Road 16 from County Road 16A to San Marco Avenue with an exception from west of Verona Way to the St. Augustine Premium Outlets north entrance in late April. 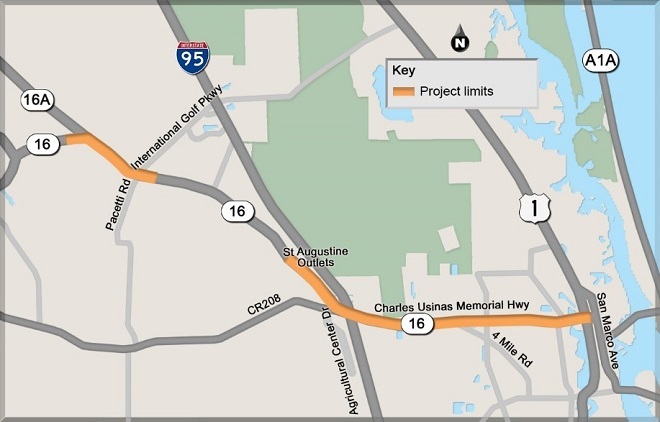 Construction will include the replacement of high mast luminaires at the I-95 interchange, overhead street lighting from County Road 16A to San Marco Avenue (S.R. 5A) and other associated work. Chinchor Electric Inc., was selected to complete the 600-day project.